We’re always looking for an easy dinner idea that tastes good, too. 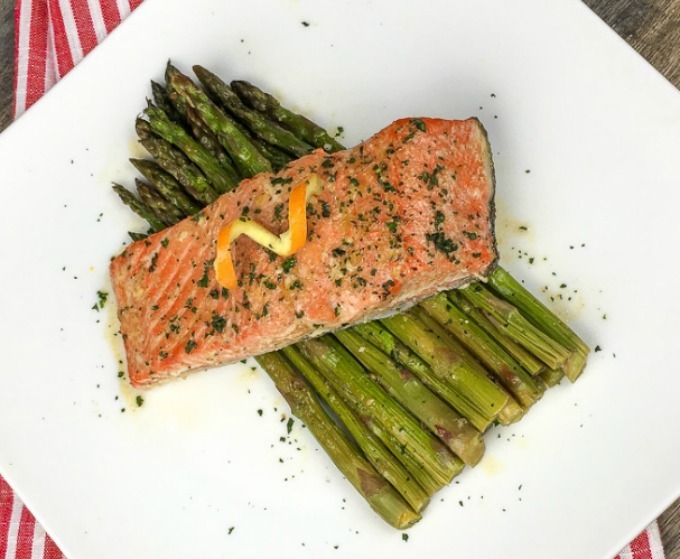 This orange glazed salmon sheet pan recipe falls into that category. It goes from ingredients to table in less than 30 minutes! We’ve made great salmon recipes before, but this is even easier. Not only that, it’s healthy, too! And it tastes good! This easy weeknight meal is checking off alllll the boxes. Did I mention that the prep time is basically nil, too? Oh yeah! You’ll want a good sized sheet pan that has decent sides on it. This helps keep the juices in the pan, and minimizes oven cleanups due to spills. No one wants that! You might also want a non-stick baking mat, like this one. It helps prevent your food from sticking. Because, after all, what’s the point of a great easy dinner recipe if half of it gets stuck to the pan? A quick dinner recipe that's oh so easy. Did I mention it's healthy, too. No refined sugar, gluten free, and Paleo friendly. Preheat oven to 400°F and line a large, rimmed baking sheet with a piece of parchment paper or a non-stick baking mat. Place the salmon filets skin side down in the center of the baking sheet and set aside. Add the asparagus to the bowl with the orange juice marinade mixture and gently toss to combine. Season asparagus with additional salt and black pepper, to taste. Isn’t that easy? The only real work is trimming the asparagus, and making the marinade. I mean…COME ON! That’s not even work! 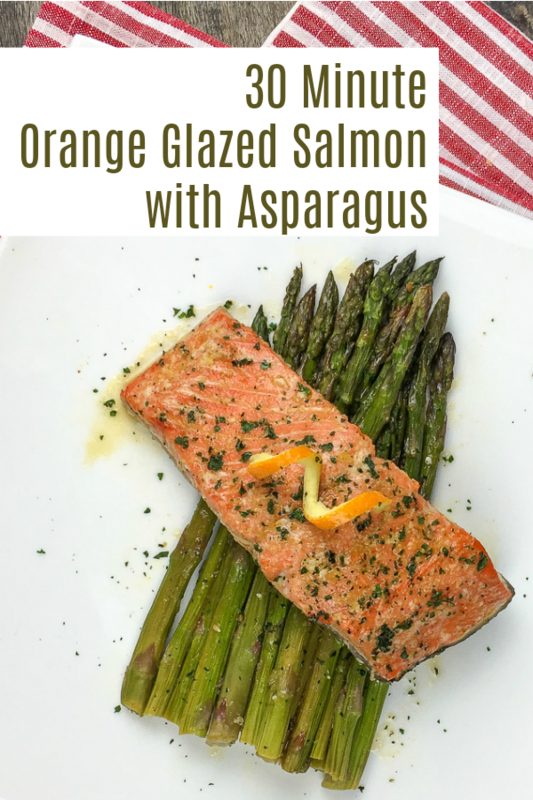 This orange glazed salmon recipe makes a great weeknight meal, or a fantastic weekend date night meal. Your significant other will never know how easy it really is, but they’re sure to be oh so impressed. And with the sheet pan recipe, cleanup is pretty much just as easy as cooking was. WHOA! Love this sheet pan recipe? Be sure to check out our Sheet Pan Steak Fajitas, too!